Huge health problems in Australia by those exposed to windfarm infrasound. A particular case in point, followed and highlighted by radio king Alan Jones, has been the despicable treatment of Anne Gardner by wind-industry giants AGL. A “clear link” between the amount of noise emitted by an energy site and irritation experienced by nearby residents was identified in a report commissioned by the Department of Energy and Climate Change last year. Published this week, the paper said there was an “increased risk” of suffering from sleep deprivation from turbines exceeding 40 decibels. But the prospect of a sleepless night was generally an “indirect” link caused by the frustration evoked from having a loud wind farm in your community, it added. The review recommended that “excessive” noise should be clamped down on, citing potential measures such as modifying the turbine blade. The findings ratcheted up pressure on the Government to be more heavy handed with noisy farms, with one MP calling for them to be “shut down permanently”. New York Post all over it again with this epic cover – Gold! We were extremely fortunate that Matthew—category 5 through much of the Caribbean—weakened to category 2 before landfall in South Carolina. It could have been much worse. In 1893 a much stronger hurricane followed nearly the same track. When its eye reached the Georgia and South Carolina coasts, a 15–20 ft. storm surge inundated the coastal islands. Though population was a small fraction of today’s, between 2,000 and 3,000 died, making that the second deadliest hurricane in U.S. history. The same year another major hurricane killed 2,000 in Louisiana. Meanwhile, ideologically agressive “Green” Gemany is undergoing the biggest coal-fired power expansion in her history. Cheap, reliable, efficient, hydrocarbon based energy apparently matters after spending ONE TRILLION EUROS on useless, costly, intermittent “unreliables” – wind and solar power. Germany has long been the poster-child for the wind-cult, the World over. But the way things have panned out, wind worshippers will soon need another pin-up girl. The costs of its maniacal rush into massively subsidised wind and solar to German businesses and households has been astronomical and, in the mother of all ironies, CO2 emissions continue to rise. Here’s NoTricksZone on Germany’s fall from wind cult idol, to lamentable green power disaster. Yesterday the online German news weekly FOCUS here wrote an article that is certainly more bad news for Germany’s electricity consumers, who are already paying among the highest rates in the world. ‘Sea Level Rise’ is just one in a long line of propaganda metrics used by the climate crisis industry to promote the narrative that your CO2 emissions are causing unprecedented climate change. What ‘sea-level rise’ alarmists won’t tell you is that seas have risen 400 feet (120m) over the past 20,000 years, since the end of the last Ice Age. And over the past 200 years have been rising at a steady rate of 1.7-1.8 mm/year according to NOAA. There has been no acceleration of sea-level rise since industrialisation. And critically, something other than evil plant food “Carbon Dioxide” caused seas to rise around 1790. Seas have been rising for the past 20,000 years, since the end of the last Ice Age. Something other than CO2 caused the current steady rise around 1790. Tony Heller of Real Climate Science has spent thousands upon thousands of hours of unpaid work exposing the relentless fraudulent adjustments and data tampering pushed out of government (taxpayer funded) climate institutions – NASA, NOAA, NSIDC, NCDC, CSIRO, BoM, UN IPCC to name a few. The fraudulent data is then fed to the sycophant, global warming alarmist mainstream media, published as gospel, and voilà – the “Climate Change Crisis” is born! 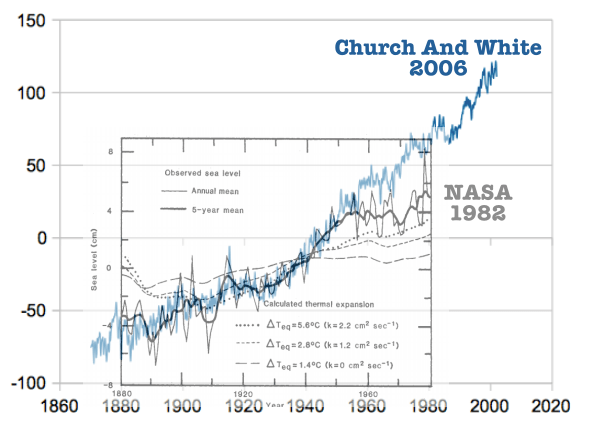 In 1982, NASA showed that sea level rise dropped off sharply after 1950. In 1990, the IPCC said there was no convincing evidence of an acceleration in sea level rise during the 20th century. 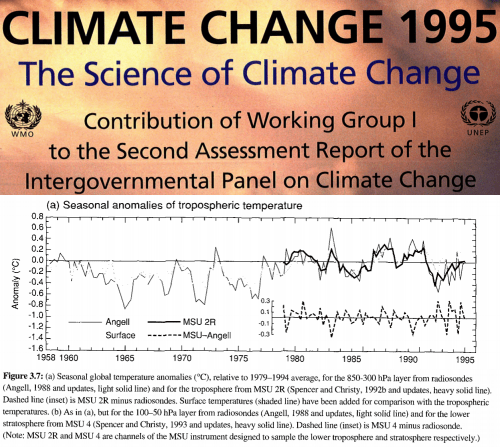 The 1995 IPCC report showed no warming from the 1950’s to the 1990’s. The NASA/IPCC data wrecked two essential parts of the global warming scam – post-1950 warming and post-1950 sea level rise. So they found people who were willing to change the data to match the models. The current NASA sea level data is based on this confirmation bias fishing expedition. The overlay below shows how they changed the post-1950 data to match the theory. 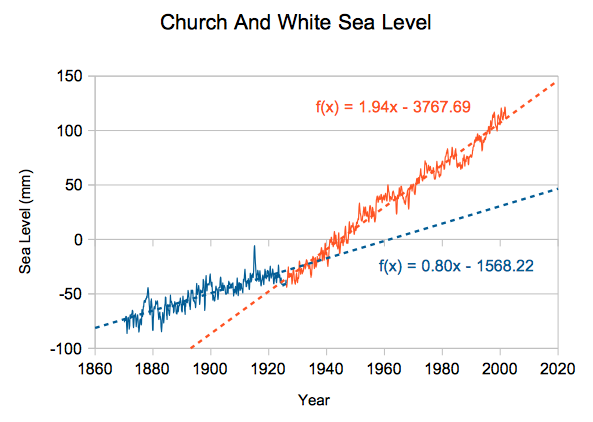 Church and White discovered a mysterious break in sea level in the year 1926, when sea level rise rates suddenly increased by almost 250% to 1,94 mm/year. 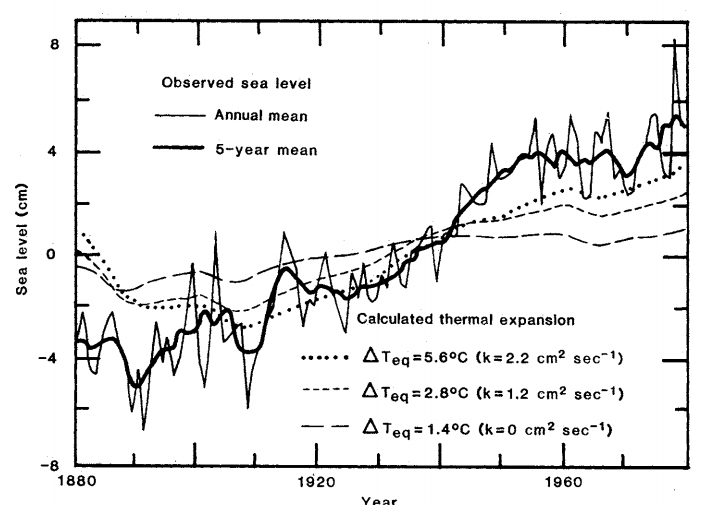 I can’t find one single tide gauge anywhere on the planet which shows this post-1926 acceleration. The Church and White study is utter nonsense. But the NASA fraud gets worse. Their tide gauge data says 1.94 mm/year, but their web site shows 3.4 mm/year. Only 10% of NOAA tide gauges show that much sea level rise, and all of those are in places where the land is rapidly sinking. 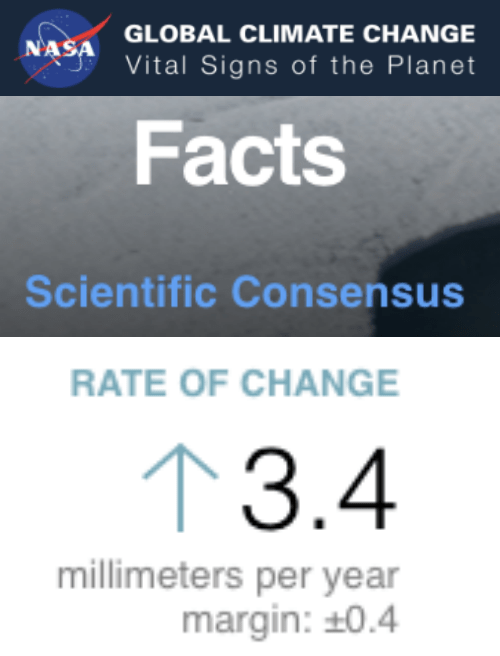 NOAA says sea level is rising half as fast as NASA’s claims. NASA sea level claims are blatant fraud – being done right in front of our faces. NEW PAPER : The global mean sea level started decelerated rising since 2004 with the rising rate 1.8 ± 0.9 mm/yr in 2012. NEW PAPER : Sea level rise slowed from 2004 – Deceleration, not acceleration as CO2 rises. BOOM. Though a Podesta email push probably not necessary for the progressive mainstream media to link ‘Extreme Weather’ with ‘Climate Change’ – it’s become their national pet-pastime. 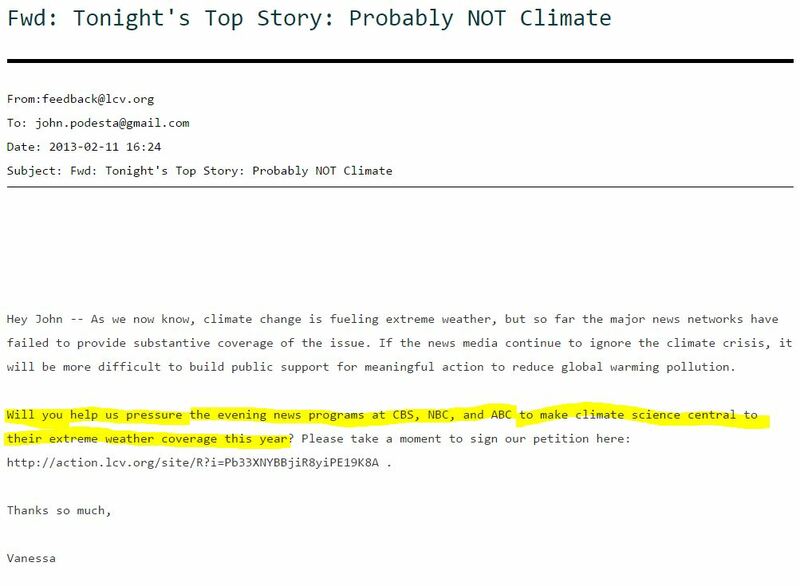 From the “say anything” department, comes this email where the League of Conservation Voters asks Hillary’s campaign manager John Podesta to “…help us pressure the evening news programs at CBS, NBC, and ABC to make climate science central to their extreme weather coverage this year?”. From record-breaking heat waves and massive wildfires to historic droughts and Superstorm Sandy, we’ve seen with our own eyes the increasing severity and frequency of extreme weather events this past year. Yet in reporting on these disastrous events, the nightly news programs at the major broadcast networks have largely ignored what is fueling this extreme weather – climate change. Stern will simply claim he had ‘good intentions’, like all the global warming vampires caught red-handed sucking the blood out of the taxpayer, fraudulently. Time to lockup those who take advantage of the taxpayer under the guise of “saving the planet”. Really. One of the most influential warming alarmists (and an Australian ABC darling) hasn’t just wildly exaggerated the dangers of global warming. One of the world’s leading institutes for researching the impact of global warming has repeatedly claimed credit for work done by rivals – and used it to win millions from the taxpayer.